Leeds United boss Garry Monk has revealed that the club took the decision to sell Lewis Cook after the talented young midfielder made it clear he wanted to leave this summer. Cook left for Premier League team Bournemouth on a £7m deal that could rise to £10m to leave a number of Whites fans angered and upset that another top prospect to come through the ranks had been allowed to go. However, Monk said the club had tried all they could to persuade the England youth international to stay, but with only one year left on his contract it was considered best to accept Bouurnemouth’s bid rather than keep an unsettled player. He told LUTV: “It’s a situation in football which is very common, it happens every single year at every single club. “Of course myself and the club wanted Lewis to stay. I know the club made huge efforts to keep him here, in terms of a contract and otherwise and myself with the football side of it. “I think you have to accept sometimes that a player really wants to go himself, and his agent wants to take it that way, and then the club feel they have done all they can to keep him down here. “If a bid comes in which the club find acceptable, nine times out of 10 they are going to accept it. That’s nothing strange or new - it happens at every single club in the transfer window. “Myself and the club did all we could to keep him here, but the player really wanted to go. He could have been an important part of the team, but we move on. Leeds, meanwhile, are continuing to be linked with several players to bring into the club, including a possible midfield replacement for Cook, with Morley’s former Whites captain Jonny Howson among those being mentioned. But they appear to have ended interest in former Watford centre-back Joel Ekstrand after being strongly linked with a move for the 27-year-old free agent. Concerns regarding the fitness of the Swedish international, who has not played competitively since suffering a serious knee injury playing for Watford in a Championship game almost 16 months ago, seem to have scuppered hopes of a permanent deal. 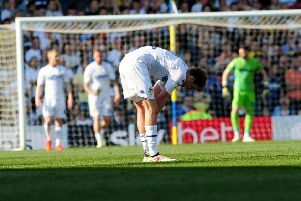 A play-as-you-play deal is still being mooted as a possibility if Ekstrand can prove his fitness, but any realistic hopes of him earning a long-term contract at Elland Road appear highly unlikely.